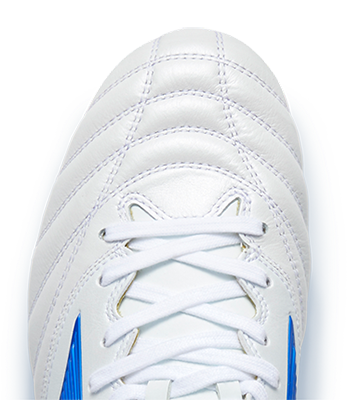 Crafted in Japan by hand from the finest ‘Mizuno K-Leather, the Rebula 2 V1 Japan adds the precise touch to your game thanks to an innovative new CT Frame in the forefoot area, for a barefoot feeling that makes for more controlled, intelligent play. A dual-density outsole maximises traction and acceleration, whilst a stretchable mesh wraps around the foot for a superior secure fit. All new ball striking focused on `Mizuno K-Leather´ CT Frame design combined with Mizuno `Made in Japan´ quality handmade construction. Highest kangaroo leather quality for premium comfort fit and natural ball touch. It is a revolutionary concept, with an integrated memory foam construction which controls three key performance characteristics: Fit, Stability and Touch.